So whaddaya know, when one of the coolest and funkiest joints in town announced that they would be running a special Molecular Mondays for a few weeks, the Boy fresh out of hospital exclaim, “WE MUST GO!”. However, we took lots of pictures and some form of notes (I apologise in advance as I had the matched cocktails set and was very very happy by the end of the night, my notes, not so happy…) to share our dining experiences with you 🙂 Aren’t we the best?! On the last Monday of July, the Boy and I excitedly walked through the city to get to the Aylesbury for our 6.30pm booking. As we walked in, we were approached by people wearing lab coats! My first instinct was to shout, “It wasn’t me! Please don’t lock me up!” before realising that it was the staff coming to greet us and take us to our table. Priced at $75 for 8 courses, it was a ripper deal! As mentioned I also went with the matched sensory drinks for an additional $55 for 5 drinks. 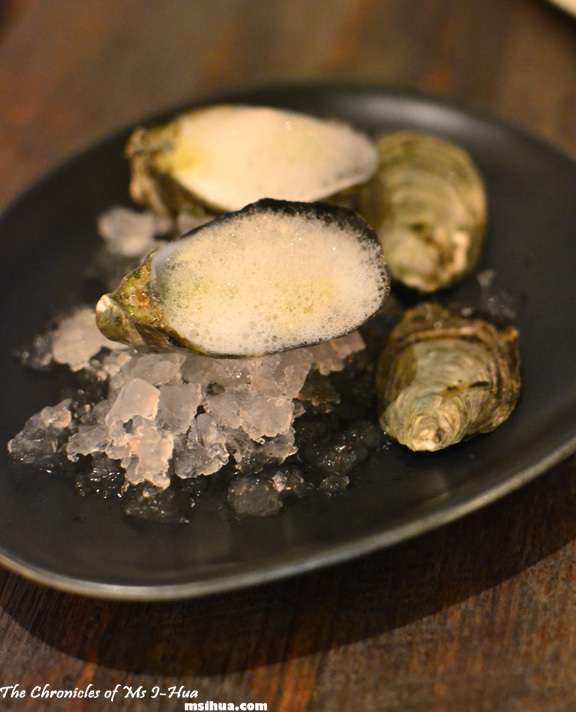 Oyster Straight From Coffin Bay which was topped with what I think I was told was peach granada. I’m assuming it was a peach flavoured foam? The second entree we had was Duck A L’Orange. Now this isn’t your usual orange and duck dish, kids. At the Aylesbury’s Molecular Mondays, this came out to be duck confit encased in the middle of two orange macaron shells. Now that’s genius! I absolutely loved the idea behind this concept. 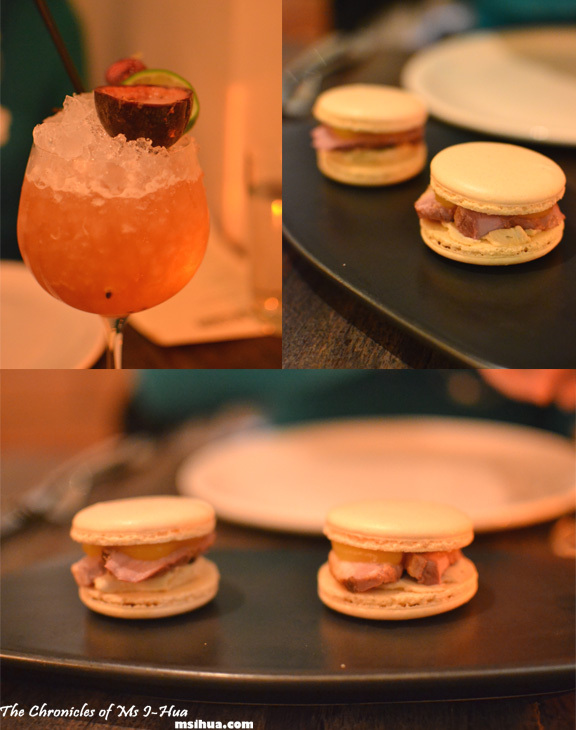 Who said that macarons could only be desserts? 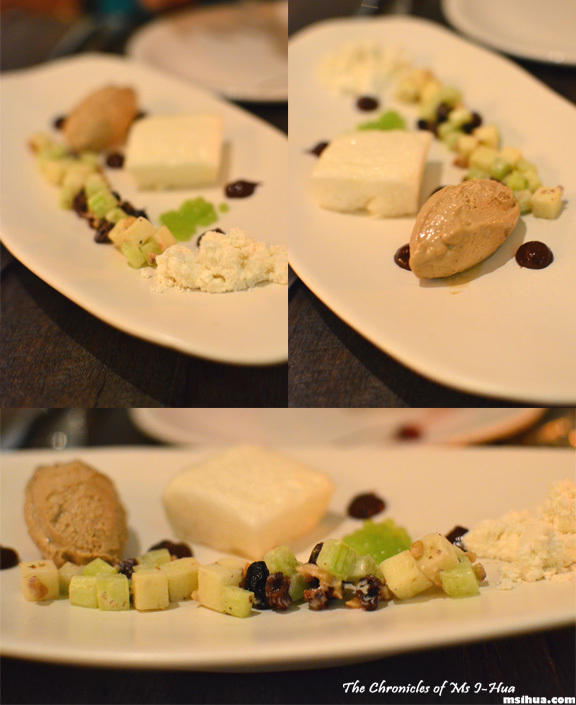 Out next was The Waldorf, an obvious tribute to the classic Waldorf salad in a deconstructed style. On the plate was walnut ice-cream, sultana gel, apple sponge, celery caviar and freeze-dried mayo. I’ve never been a big fan of Waldorf salads, only because I’m not a fan of walnuts. But this version literally blew my socks off. The walnut ice-cream was so light and unoffending, I delved back for more. The apple sponge was more like apple foam, cut into squares and placed on the plate, light and airy but bang with apple flavours. The freeze dried mayo had a strong taste of garlic in it, which made me think it was freeze dried aioli instead. Lining the side of the plate is the real Waldorf salad in all its textural glory. The next drink I had had got to be the best cocktail I’ve had this year. 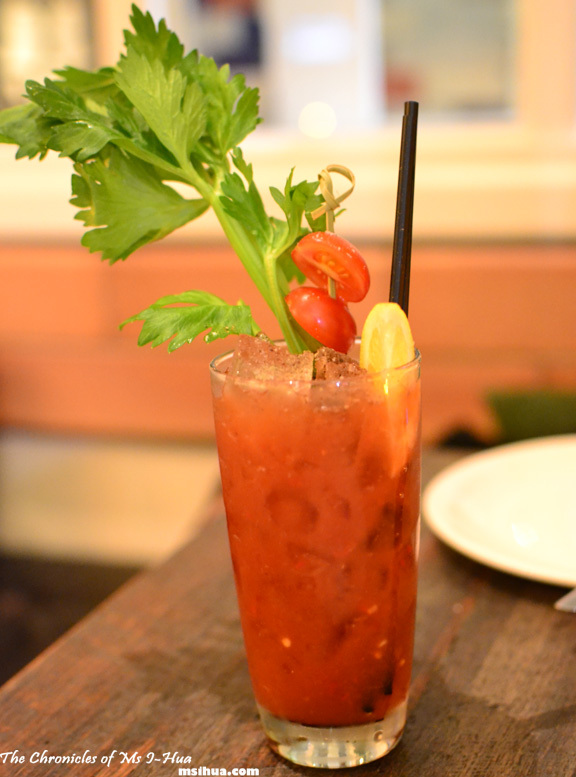 Called the Bloodiest Mary it certainly had spice, spice and spice. I don’t even like Bloody Marys in general because I find them too tomato-ey. But this version, OH EMM GEE! The tabasco and chilli in it had me slurping and gasping in a never-ending cycle. The Boy thought it was the funniest thing. So spicy and good! The cocktail certainly was paired very well with our main meal of the Great Barrier Reef. We had art on our plate ladies and gents. Served on a blue strip of tomato paint was a deep fried soft shell crab, clams, foraged seaweed, saffron foam, dehydrated salmon skin, scallop and cured kingfish (the red pieces). This was our favourite dish of the night and it ticked all the boxes for us. For our final savoury course and our last main, we were served a Corn Fed Chicken, Corn. 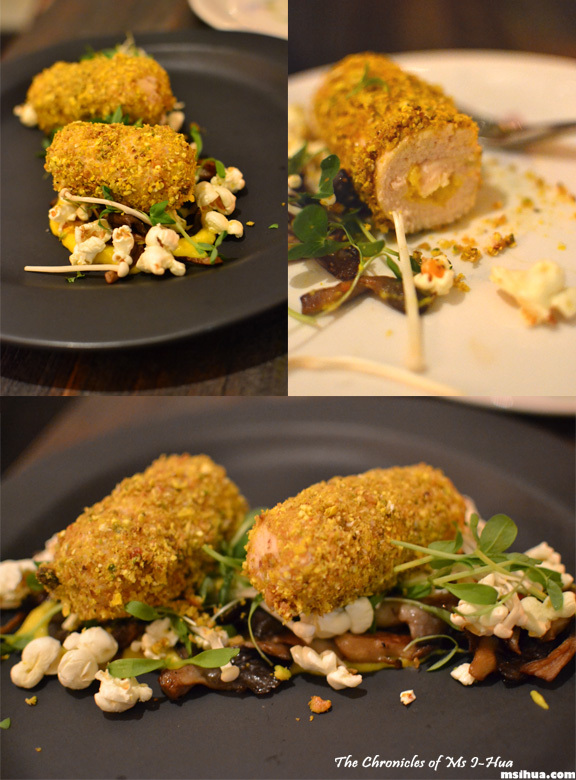 The chicken was crumbed with pistachio, corn and chicken skin served atop a bed of corn foam, pop corn, fried shimeji, enoki and oyster mushrooms and pea sprouts. As we cut open the crumbed chicken, revealed was corn pureé within. This dish was nice but it didn’t wow us as it did with the last seafood course. We both agreed that it would have been hard to topped the lovely dish we had before. This dish was paired with a beautiful glass of Eden Road Pinot Gris 2011 (Canberra). For our first dessert we were served a Parma & Pot. Our waiter cynically left the dish on the table, said, “Enjoy your chicken parmigiana” and told us he’d be back to explain later. Upon first impressions, the Boy and I did a double take as we stared at our tiny parma. It looked like a parma topped with grilled cheese and ketchup. It didn’t smell like one. 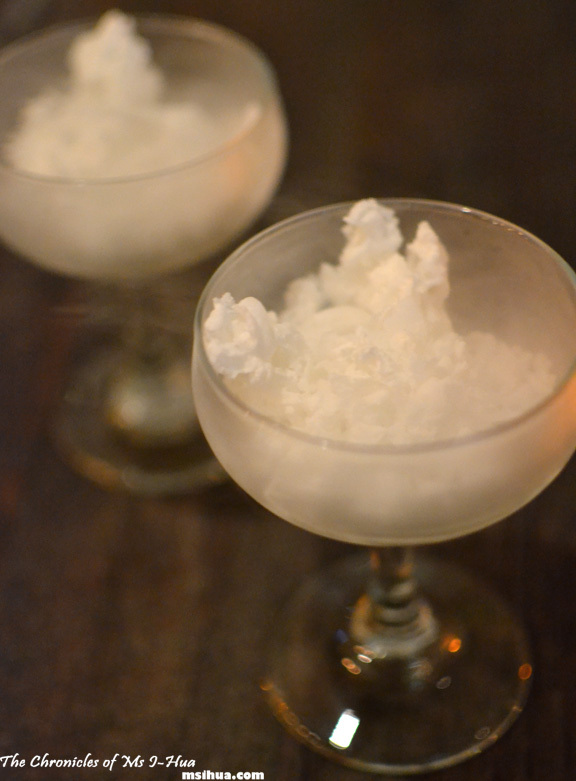 With our minds suitably boggled, we clapped our hands in anticipation of our last course of the night, simply named Mining. And boy was that a good wait. 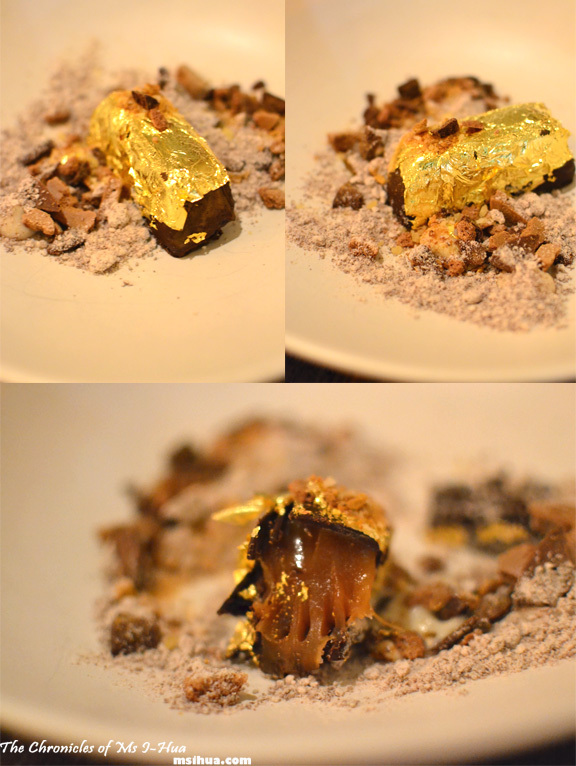 Chocolate wrapped with gold foil, lavender jelly, caramel, freeze dried chocolate, chocolate soil and pop rocks!!! It certainly looked as if we were eating a mining site. The caramel was so oozy and gooey and all things goody (sorry!). This was paired with Alvears Solera ‘1927’, Pedro Ximenez (Montilla – Morilles Spain) which I absolutely took my time in sipping till the very last drop. 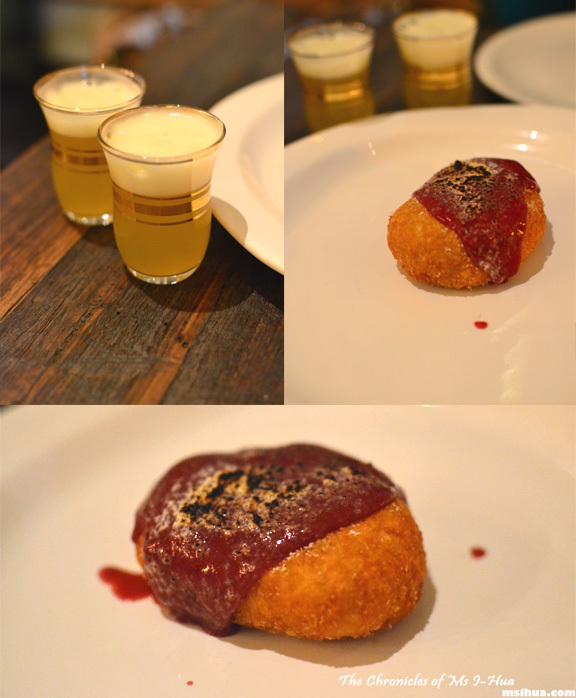 If experimental Monday food is so good at The Aylesbury, I can’t wait to return and try their real menu! 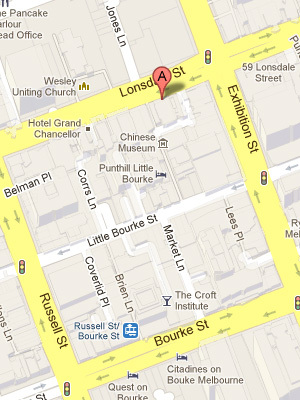 **Please note: The Molecular Mondays ended on 13th August 2012. So cool, al the dishes have changed, and again they tease the mind. 🙂 The Great Barrier Reef looked very good indeed! Interesting, thought they would’ve pulled out the inspired St Kilda Beach dessert that Fatboo had! Lol…I thought so too, but the night we were there it was a new chef in charge of the menu, so it was a new 8 courses set out! Fun nevertheless! GOSH. I’M AN HOUR AWAY FROM BREAKFAST! THIS IS TORTURING ME. ASOIOAIRHWOIERHWOIFHIOH!!!! Michelle recently posted…Maybe my voice is not dead yet. I know.. fun and awesome is a great WIN! It was super exciting that jam donut!!! I know right! Quick get Lux bite on it! It’s too cool! But they’ve stopped the Molecular Mondays now. 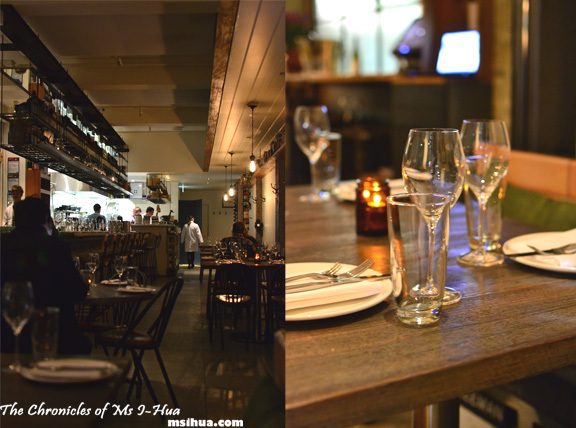 Popcornandtoast recently posted…Fandango; North Melbourne. Wow looks great. 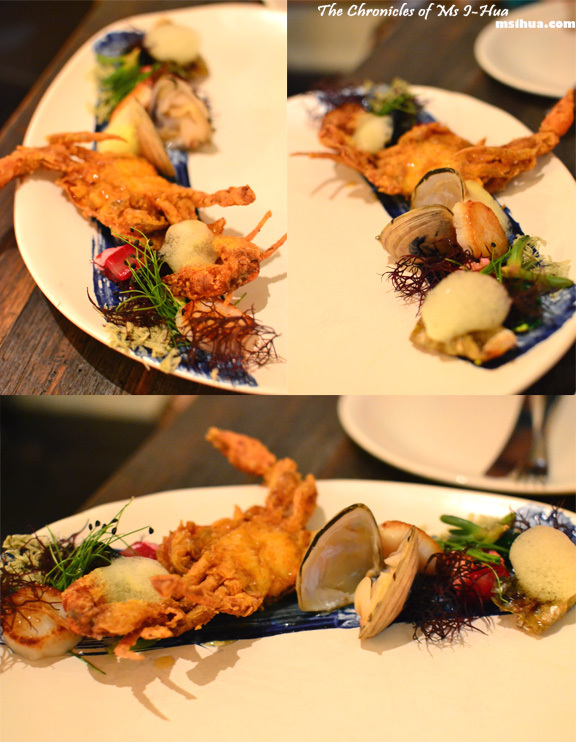 I love the look of the soft shell crab dish and golden dessert. Can’t believe you don’t like walnuts. Cray cray. Lucky you weren’t taking the photos or else by the end with all those cocktails the photos would be a bit blurred. I’m sure your drunken notes were 100 times better than my sober notes. You’ve seen my notes – you know it’s true.